Hello interweb! Welcome to the first ever blog post for Quantise! The aim is to share easily digestible engineering tidbits acquired over the last 3 decades, and with your participation and comments, build on these for the benefit of all visitors. My chief activities over the last 30 years have been in machine test & measurement, machine design and design audit, stress analysis, fatigue analysis, and failure investigation. A huge portion of my work has been with mining and other heavy machinery. I’ve spent considerable time at the coalface looking to improve machine performance and solve reliability problems. My approach has always been to understand, as well as possible, the root cause of any machine problem. For me, this has always meant simplifying or modeling the problem in a way that I (and by extension, pretty much everybody else) could easily grasp. This sometimes demands physical measurement, but it always demands a robust understanding of engineering fundamentals – liberally sprinkled with the odd rule of thumb. Some rules of thumb become almost indispensible for quickly identifying or dismissing potential failure modes or first pass design concepts, and this post presents a rule of thumb I developed a long time ago as a trainee at BHP. It’s not hard to find bolt capacity tables these days. An Ajax catalogue or similar can be materialised from Google in the blink of an eye. There’s even an iPhone App for bolt design. However, at remote mine sites or underground, and in many other situations, these marvels tend to be about as helpful as my copy of “Steel Designers Handbook” (Gorenc and Tinyou) on the bookshelf back at the office. Here’s a simple way to carry all you need in your head: D²/100. Of course, you’ll also need to remember what that means! No prizes for guessing that D stands for diameter – so that shouldn’t be too hard to remember. Strength (axial and shear, but not bending or torsion) is proportional to area, which makes a D² term pretty logical – no real challenge there either. About the only things to remember are to divide by 100 (hint: you won’t need a calculator), and that the result is the tensile capacity in tonnes of a 4.6 grade bolt with diameter D. It’s not perfect, but it’s perfectly adequate for judging whether your bolt of choice or the next size up will be safe. Remember, bolts are available in only a finite number of diameters, and as with many things, the distribution of sizes often approximates a preferred number system (I might do another post one day on why this is). Let’s do an example. The safe tensile load for an M20 grade 4.6 bolt is 20² ÷ 100 = 4 tonnes. Hey presto! It’s so easy we may as well do another. The safe tensile capacity of an M16 grade 4.6 bolt is 16² ÷ 100 ≈ 2.6 tonnes. Now for the really useful bits: Shear capacity is half the tensile capacity. So for the M20 bolt in the example above, the shear capacity would be 2 tonnes. If the bolt is in double shear, then the capacity is back up to 4 tonnes. Double everything if you have an 8.8 grade bolt. Remember that the value to the left of the decimal point in the grade designation is the bolt material Ultimate Tensile Strength; 8 is twice 4, but you know that anyway, so still no real challenge there either. Another example: the tensile capacity of an M24 grade 8.8 bolt is 24² x 2 ÷ 100 ≈ 11.5 tonnes. The shear capacity would be ~5.75 tonnes, or the same as the tensile capacity of an M24 grade 4.6 bolt. Conveniently, the capacity of a friction type joint (single interface) is roughly the same as the shear capacity per bolt. Guess what to do if there is more than one interface – yep, multiply by the number of interfaces. So putting that single new piece of knowledge, D²/100, together with many things you already know, means you can come up with sensible design sizing in your head while sitting on the bus to and from work. It means you can get an instant appreciation whether the failure you’re currently assessing might be due to an undersized bolt. Applications are not isolated to bolts; it’s transferable to any solid round section, and it’s even more conservative for solid square sections. 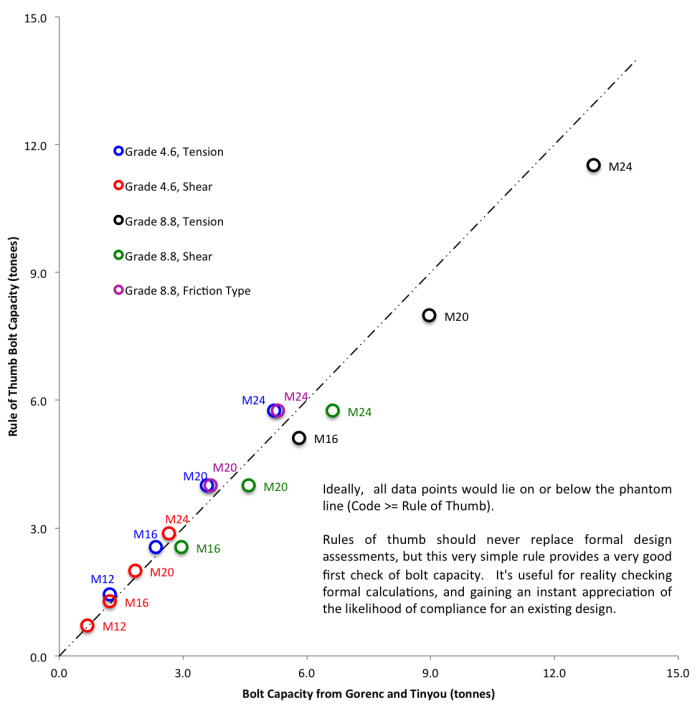 It’s application could be pushed as far as 12.9 grade bolts (assuming their capacity is 3 times that of grade 4.6), but the estimated capacity at that end of the spectrum might be a little too conservative; you’d probably survive with the next bolt size down. The chart below compares the rule of thumb against documented safe loads for a range of bolt specifications. Rules of thumb should not be adopted as a substitute for analysis complying with relevant standards, but they can provide useful reality checks and initial estimates to get the ball rolling. I’ll aim to post another rule of thumb shortly. For this next one, the answer will be 150. Let me know if you think you know what the question might be. Additionally, please feel free to share any rules of thumb you have found useful in your experience. Great post! Having been on both sides of the fence in design and operational roles is very handy to have information like such to be able to make quick and reliable decisions. Thanks for publishing this information. Great idea to have an engineering blog. The idea is simply – ‘ingenious’ . I like the content as well as the style of the blogs. Keep on with these please, ‘by the end of the day’ it becomes a sound engineering toolbox.